TOMS RIVER, NJ (January 31, 2004) – Although Darren Rutherford, a standout defender on the Jersey Shore Boca U17 Super Y-League team last summer was not selected for the SYL Regional team, he returned from the Florida tryouts this week grateful for the opportunity to show his talents on a national scale. Rutherford, along with seven other players from Boca’s 2003 Super Y-League teams, were named to the Super Y-League Mid-Atlantic ODP Regional Player Pools. They traveled to the Cocoa Expo Sports Center in Cocoa Beach, Florida from January 23rd to 25th where they were evaluated by the SYL Scouting Staff and United States Soccer Federation National Staff Coaches in hopes of being identified for the US National Teams Programs. 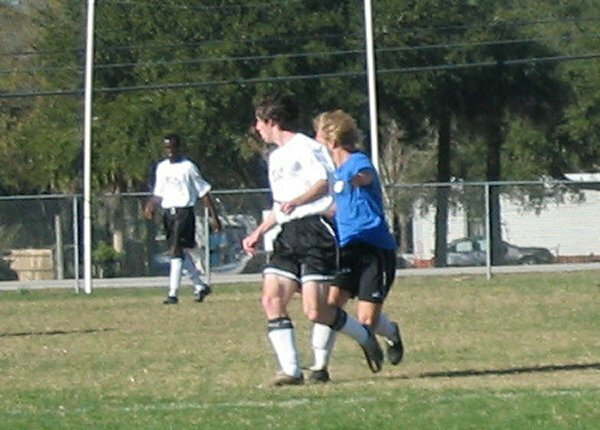 The eight Boca players were selected through the Super Y-League’s National Scouting Network from their play during the 2003 Super Y-League season. They were joined by some of the best young soccer talent in the Northeast, including players from FC Delco (PA), the Cape Cod Crusaders (MA), Boston Bulldogs (MA), Rhode Island Stingrays (RI), Brooklyn Knights (NY) and youth development teams from DC United (MLS) and the MetroStars (MLS) among others, to vie for spots on the SYL Regional Teams. “The trip down to the Cocoa Expo Center in was great. Friday consisted of a training session in the morning and then a game at night. Saturday we started off with a game, then a training session at night. Sunday we had a game in the morning and then checked out. The training was top notch” elaborated Rutherford. “One of the things our coach would always tell us each day was to act and play like a professional, whether it be on or off the field. The quality of play was phenomenal. My teammates and the opposing players all had exceptional skill. It was good to be able to play at a high level day after day. Overall the weekend was a success and worth the trip” Rutherford finished. The Super Y-League, a North American youth soccer league for elite level players, began year five in 2003 in an effort to help U.S. Soccer in its quest to put a bead on the top youth players who are best bets to play on the professional level and, possibly, become members of the U.S. National Team. The Super Y-League was granted Olympic Development (ODP) status in August of 2002. Through the SYL’s ODP system, players are identified for U.S. National Team Programs through an internal national scouting network that will select players for Regional Teams through league play and the league’s finals. This identification system provides an alternative for elite level players that excel in their natural club environment. The Super Y-League has recognized the club soccer system in the United States as being the major development platform for elite level players. Rutherford’s talents however, were noticed well before his selection to the Super Y-League Regional Pool. “Darren came to my attention as an opponent when he played for the Cape May Express. Over the years in various league games, Darren frustrated our attack and created defensive challenges for my Boca team with his swift runs from his position of stopper. When the opportunity was presented for Darren to join us, we quickly jumped at the chance to take him on board” said Bill Carroll, a staff coach with Jersey Shore Boca who also coached Rutherford on the Boca U17 SYL team last summer. “Darren is a hardworking, tenacious defender that is not afraid to push forward and join the attack. Darren will play at the next level and I look forward to following his continued success” Carroll finished. Rutherford hails from Cape May, NJ and attends Lower Cape May Regional High School. The senior marking back has narrowed his college choices to either Temple University (PA) or Rider University (NJ). He plans to peruse a film and communication major in college.